Highlights of our veg from 2018, grown by us, pesticide-free here in Farnham. If, like us, you gave in to festive gluttony and are feeling a bit guilty, don’t be! In medieval times there really were twelve days of Christmas, punctuated with many feasts. In comparison, our measly two days of celebrations are very sensible. In this darkest of months we feel a legitimate need to cheer ourselves up, to feast and light fires (or maybe just fairy lights on our Christmas trees). There is nothing modern about celebrating at the end of December; it is a time which has been celebrated long before the advent of Christianity, as it is when the winter solstice happens. To you and me this simply means that the shortest day is now behind us and the daylight hours are slowly but surely increasing. The worst is behind us! Plenty of leafy greens filled the bags in December, such as bouquets of luscious green ‘pentland brig’ kale, frilly ‘scarlet’ kale and dark, earthy ‘cavolo nero’ (also known as dinosaur kale!). There were also clouds of loose-leaf winter salads, including a mix of baby mustards, baby pak choi, rocket and a variety of lettuces. Previously we would weigh and bag loose delicate leaves such as salad, spinach or chard into degradable plastic bags, but we now provide our members with the option to weigh their leaves into their own bag or container, therefore reducing the amount of plastic we use. It would not be winter without something more solid in the shares. Rooty delights this month were represented by celeriac, Jerusalem artichokes, beetroot and parsnip. The last one proved to be a true survivor. The tops did not look very promising and we were worried that the roots hadn’t developed well, due to the hot and dry summer. However the harvest was a pleasant surprise with some lovely sized roots hiding in the soil. In December, thanks to our volunteers, we planted another 100m section of hedgerow, using saplings kindly donated to us by the Woodland Trust. This hedgerow will increase biodiversity at the farm, and provide important habitat and food for wildlife. A group of pupils from Abbey School who volunteer with us every week were part of the team who helped us with this planting. Abbey School specialises in educating children with learning difficulties and additional needs, particularly autism. The end of the year marked the end of this group’s time with us, and after two years we’ll be sad to see them go. The change we’ve seen in all of the pupils over that time has been incredible. Many of them now sprint out of the bus into the field, they’re that keen to start work! It's clear to us, and to their teachers, how much their confidence increased as they became more comfortable and familiar with the farm and with our team. For their last visit we said a fond farewell with hot chocolate and homemade mince pies. This year we'll be welcoming a new group from Abbey School to the farm. Just before Christmas, on the 23rd December, FCF hosted the charity tea tent at the Farnham Farmer’s Market, selling cakes and other home-made goodies prepared by our lovely volunteers. Thanks to everyone who helped out with the event; we raised over £250 which will go towards the running of the farm. We're certainly enjoying the prospect of a new year as that means a new growing season, and the chance to 'reset' the field and what we're growing. We're keen to get the farm filled to the brim with crops, so we can provide our members with as much veg grown by us as possible. After a break to recharge our batteries, we are now working on the crop plan for 2019-20, and to help shape our decisions on what vegetables we should grow we asked our members to complete a survey. As a Community Supported Agriculture (CSA) farm, and a co-operative, it’s really important to us to hear the thoughts and feedback of our members, and for them to have a say in what happens at the farm. We were really pleased to see from the survey that 94% of respondents said they were ‘very satisfied’ or ‘satisfied’ with Farnham Community Farm overall. Thank you to FCF volunteer Joanna McCaffrey for writing our monthly news from the farm. The going is getting tough in the field with heavy morning mists, cold, rain, biting wind and the occasional frost. With the descent into winter the days in the field are getting shorter, so the team have to plan their time wisely as before you know it, it’s dark! Despite the cold weather November is a bountiful month for UK veg, with a variety of versatile winter greens and hearty roots to fill the veg bags. Saying that, in the second half of November we’ve bought in veg more than we usually would at this time of year, and that’s due tothe affect of this summer's drought and the hottest temperatures since 1976. The UK really relies on it's rainfall to grow crops, and we especially suffered at Farnham Community Farm as we didn't have an irrigation system set up. This meant to get water to our crops we had to ferry watering cans back and forth, and water by hand. Some days we'd get nothing but watering done. The effect is felt now as it's our slower growing crops, that stay in the ground for longer, that were hit worst. Just as the seedlings were trying to make roots and establish themselves in the soil, the rains stopped. It was difficult for the ground to soak up any water we applied, as it burned off in the searing temperatures. To add to the hurdle of the drought, our pedestrian tractor had been stolen at the beginning of April. The replacement we were borrowing broke down in early June, just as we were prepping ground for a huge amount of planting. Without mechanical means to prep ground, the already dry soil became very difficult and slow to work, and we missed a lot of plantings. Some crops we haven't been able to grow successfully at all this season; brussel sprouts, calabrese, swede. Others, like the squash, grew much smaller and were less prolific, so they didn't spread out over as many weeks as we'd have liked. However, we did have a great success with quick growing varieties such as sweetcorn, courgettes, cucumbers and tomatoes, that loved the extra sunlight and were extra delicious. What we do buy in is always organically certified, and nearly always grown in the UK (except the 1-2 weeks in the year when there is hardly anything available from the UK... it's called the hungry gap for a reason!) It's positive that we get to support other organic growers, without the use of supermarkets. Some parts of the UK have soil perfect for growing potatoes, carrots and cabbages, so you get the best the UK has to offer. Where we had to choose what crops to sacrifice this year, we opted to grow the leafy, more delicate varieties ourselves, and buy in veg that transports well, such as roots and cabbages. If we are hit with another hot dry summer again, which is likely, we are now more prepared and more resilient. The main phase of our irrigation system is installed, and by summer we should be able to automatically water crops at the turn of a switch, leaving the team to get on with prepping soil and planting out. The water pressure has been greatly improved, and we're no longer restricted to what hours of the day we can water. Our new tractor and extra attachment means we can prep beds in a fraction of the time. Another plus of next year will be that propagation will be at West farm, not at another site. This means the team will be able to keep a closer eye on the early stages of crop production, and save time by not travelling from one side of Farnham to the other. Back to November’s recap; we welcomed the month with a gloriously sunny Social Saturday on the 3rd. The highlight of the get-together was a bonfire, started with some traditional bushcraft fire-lighting skills. Apart from adding to the warmth and mood the fire provided some food in the form of roasted chestnuts and toasted marshmallows – the consolation of cold months! With home-made smoky beans and jacket potatoes, steaming soup, sausages, cake and biscuits our wonderful volunteers made sure we had plenty of food to keep us warm inside out. The shares have been both leafy and rooty this month, making for varied and colourful meals. There is a wealth of recipes out there for these versatile ingredients. We loved the crunchy heads of purple-red radicchio, and its cousin escarole, with an altogether looser and frizzier appearance. These are both very versatile and do well in more than salads. They lend themselves well to winter cuisine, when you want something warm and comforting, as you can roast, grill and griddle them. For lovers of more oriental flavours in this month’s shares we’ve had coriander and pak-choi, which bring to mind South-East Asian stir fries and soups, but actually grow well here in our climate. It’s very easy to forget the final touch of a scattering of herbs, or throwing in a handful of leaves at the end of cooking, but these seemingly insignificant additions to your meal bring a boost of vitamin A and C (essential to immunity) and calcium. It seems new things grow as well in winter as they do in spring. Farnham EcoHub is a new online platform for sharing information about local initiatives that contribute to the wellbeing of the planet. It is for anyone interested in sustainable, eco-friendly and environmental matters focusing on our local community. 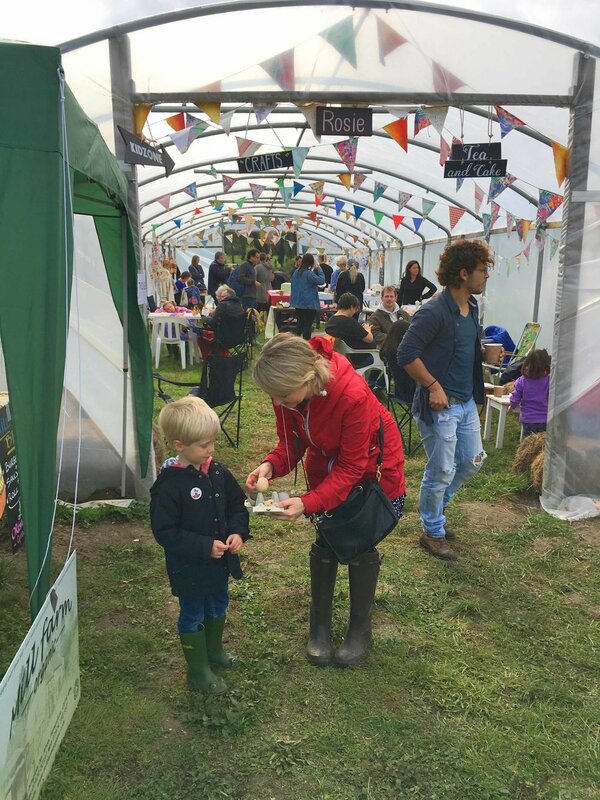 Farnham EcoHub has evolved out of the annual Farnham Sustainability Fayre organised by Farnham Community Farm which showcases many worthwhile local initiatives. Also new in November was the opening of zero-waste shop Keep, above plant-based cafe Okomoko, on Downing Street in central Farnham. Keep is run by FCF members Sarah and Annabel; the two met at our Sustainability Fair this summer. At Keep you can buy whole foods, household products and personal care all packaging free. They also sell lovely handmade eco-friendly homewares and gifts. Visit their Facebook page here. On our part we have been successful in reducing our plastic usage by offering our leaves (such as spinach and salad) loose, rather than pre-packed into plastic bags. Instead, our eco-minded members bring their own containers and weigh their leaves on collection. As of this month the rescue hens at Orchard Farm Animal Sanctuary are no longer producing enough eggs, and so we are taking a pause from the Open Food Network. Like the rest of nature the ladies are taking a well-earned winter break. In case you are wondering how the commercial farms overcome this natural process, they simply put their hens under artificial light for 12 to 16 hours a day and trick their reproductive systems to keep laying. This unfortunately means that the body does not have the opportunity to recover from the laying season and it has long-term health implications for the hens. Looking ahead to December, we are hosting this month’s fundraising tea & cake stall at the Farnham Farmers’ Market on Sunday 23rd December. If you would like to bake something for the stall, make a chutney or jam, or help out on the day, please drop us an email at hello@farnhamcommunityfarm.com. We are looking forward to getting started on another season, and gradually improving Farnham Community Farm in every aspect; from our infrastructure, to our outreach work, to our produce. We’ve had a glorious October with lots of sunshine, greedily absorbed by our crops, but we know that summer is truly over with the last of our super popular sweetcorn going out in the shares this month. We have welcomed the pumpkins and squashes, and kale is here to stay for the next few months. Try putting both together in a soup with some curry spices to warm you up on a cold evening (or pack some into a flask for a comforting lunch). If the flavour is not reward enough: you’ll also be giving your immune system a boost - with squash being one of the richest sources of vitamin A - and calcium-rich kale will strengthen your bones. Our polytunnel has done a great job protecting the tomatoes from cold night temperatures all the way through October, but it looks like we’ll be saying goodbye to them now. There will be plenty of green tomatoes up for grabs, so members - look out for that! Winter salad and leaf crops have added colour and flourish to the veg bags, with rainbow chard our particular favourite; a welcome splash of vibrant colour when mother nature is slowly reducing her colour palette to reds, browns and yellows. A peculiar tuber made its way into the shares this month, aptly described by Nigel Slater as having ‘a curious flavour poised between globe artichoke and potato’. I know you can’t stand the tension any longer, so I won’t keep you guessing…. It’s Jerusalem artichoke. These are very versatile; they can be roasted, pureed, fried, thinly sliced and eaten raw; don’t be afraid to give them a try! We are not just about vegetables, we could not function without our wonderful volunteers, who this month helped us move the compostable toilet from the old site at Dippenhall. Yay for creature comforts! It still needs to be erected, if you would like to lend a hand. Check out how to get involved with volunteering at the farm here. Apart from our amazing volunteers in the field we could not exist without our hard-working board members. During the Annual General Meeting, which took place this month, we’ve had a change of guard with some leaving us – followed with our heartfelt thank yous – and with new members stepping up. We are proud to say that our produce has been used this month with great flourish, and to mouth-watering effect, by chef Daniel Britten. He created a menu for a farm-to-table supper club event hosted by A Table Outside with The Inspiration Space, in the newly converted largest barn of Christmas Pie Barns, situated next to our farm. Guests enjoyed a starter of crispy Pentland Brig kale with cauliflower cream, honey and miso. For main; roasted celeriac, served with a malt glaze, burnt onion and smoked beetroot ketchup. Dessert was apple and almond cake, served with toasted creme anglaise. Our produce was also featured in decorating the barn. The piles of pumpkins and handfuls of autumnal flowers highlighted the rustic feel of the space, with one-of-a-kind irregular woodwork and bespoke lighting designed by Sarah, owner of Christmas Pie Barns. The beautiful converted 16th-century hops barn is now available for use for private functions. Visit https://www.christmaspiebarns.co.uk to contact Sarah for further details and pricing. Looking into the future, Orchard Farm Animal Sanctuary is organising a Christmas wreath making event on Sunday 2nd of December, with proceeds going to support the upkeep of the animals. Orchard Farm will also be hosting a Christmas Fayre and Santa’s Grotto on Sunday 9th December. If you are interested in either of these events please contact Anita via email orchardfarmanimals@gmail.com, or visit the Facebook page. Let her know you heard about it via FCF. To celebrate the launch of our new distribution we're having a get together at The Summerhouse at Packhouse. Bears restaurant on site will be providing a welcome drink and light bites for the evening. Everyone welcome! Thursday 5th April, 6.30pm onwards. We are over the moon to receive the news that our application for grant funding from the Big Lottery Fund has been successful! The Big Lottery Fund distributes over £600m a year to communities across the UK, raised by players of the National Lottery. We have been awarded £10,000 towards the salary of a Farm Coordinator, the role Katie will be officially taking up from April. We've been awarded a grant from the Postcode Local Trust! We are delighted to announce we have received £2,000 from the Postcode Local Trust towards a pump and irrigation system to water our crops at West Farm. 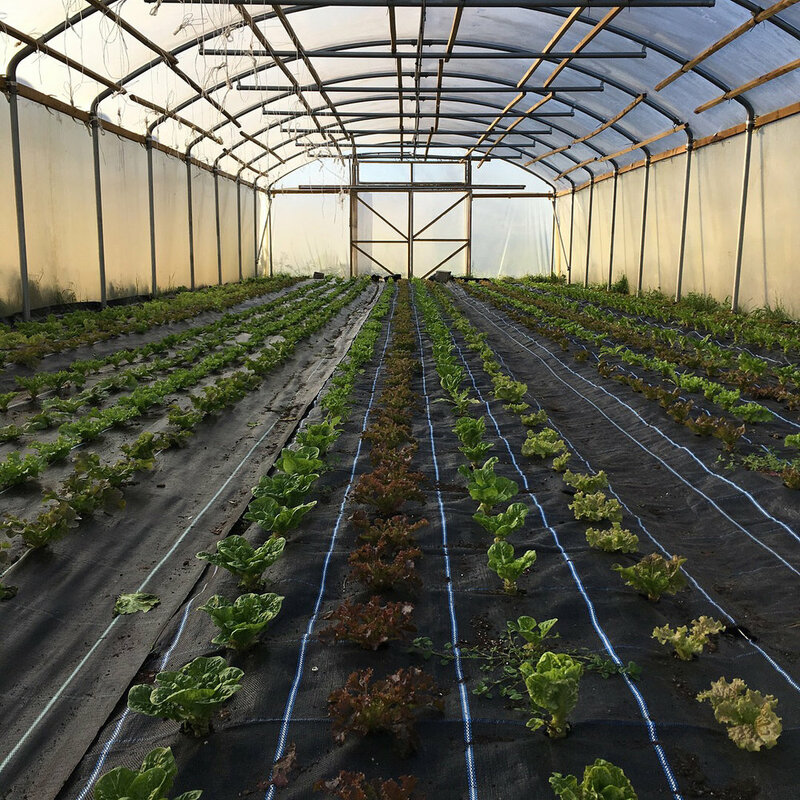 We have lots of work ahead of us to install the system and once it's in place we will have an efficient, effective method in place to give all our crops the ideal amount of water throughout the year. A few weeks ago Jane and Nick attended an Irrigation System Design Course in Glastonbury, by Feed Avalon. Their places were kindly provided free. Feed Avalon is a social enterprise dedicated to developing food systems that are socially and economically empowering in order to build food resilience. Postcode Local Trust is a grant-giving charity funded entirely by players of People’s Postcode Lottery. Huge thanks to volunteer Elaine who organised the grant application. 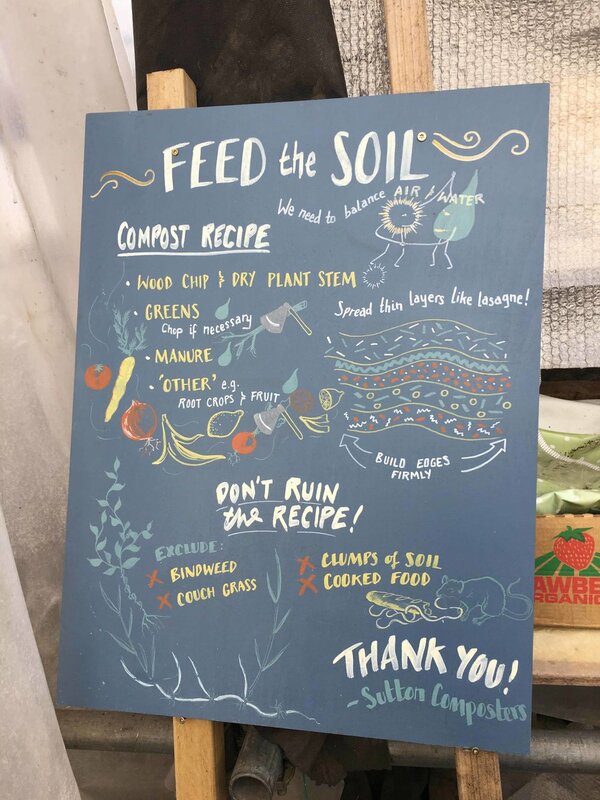 Gavin, Jane and Katie paid a visit to fellow CSA scheme Sutton Community Farm in South London this week, as part of the CSA Network UK's mentorship scheme. Sutton Community Farm have a huge membership and recently raised almost £100k towards a new barn. The visit was really inspiring and we came away with lots of tips, about growing, fundraising and more! On October 1st we opened our West Farm gates to over 200 people as part of the CSA Network UK's national Open Day. 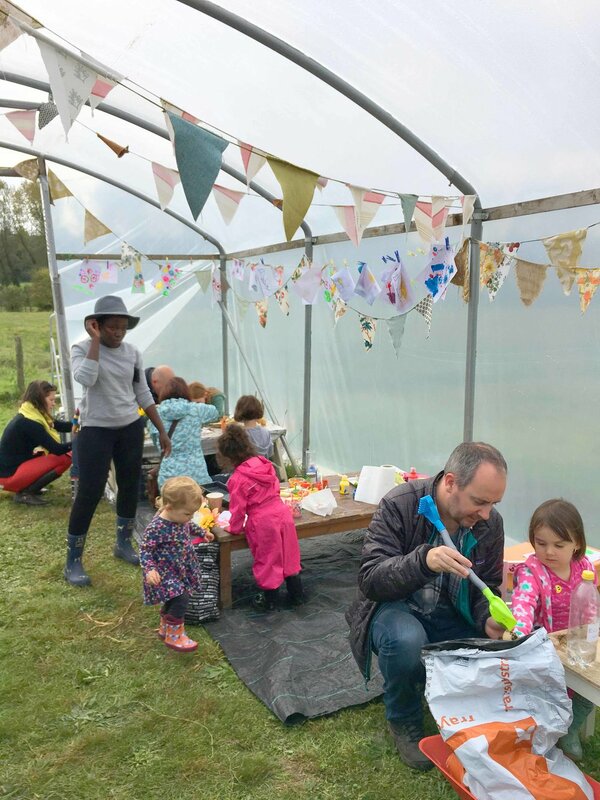 The pick your own pumpkin patch proved really popular, as did Nick's Bushcraft, and there were lots of kid's activities, including vegetable-creature making and a farm trail quiz. Visitors could choose from an array of delicious food including homemade cakes, vegan savouries and BBQ by Mill Farm Organic. Much of the day was organised and run by volunteers, thank you to everyone who lent a hand and made the day what it was! We are absolutely delighted to announce that last night Farnham Local Food (now called Farnham Community Farm) won the Services to the Community award at the Surrey Life Food and Drink Awards 2017! Gavin, Jane and Katie swapped their wellies for black tie and attended the awards ceremony at Foxhills Golf Club and Hotel. We made it to the finals through public votes, then an independent judge visited each finalist to decide the winner... but we had to wait until the ceremony to find out if it was us! Also in the finals were Dorking Food Float and Ripley farmers' market. We are so proud to have our involvement with the community, and the value we bring to people's lives, so highly recognised.